A spicy and creamy harvest celebration. Place the butternut squash on a sheetpan and drizzle each half with just enough olive oil to lightly coat the squash on the inside (about 1 teaspoon each). Rub the oil over the inside of the squash and sprinkle it with salt and pepper. Turn the squash face down and roast at 425 F until it is tender and completely cooked through, about 45 to 50 minutes. Set the squash aside until it’s cool enough to handle, about 10 minutes. Then use a large spoon to scoop the butternut squash flesh into a bowl and discard the tough skin. Warm 1 tablespoon olive oil over medium heat until shimmering in 2 quart minimum stock pot. Add the chopped carrots, onions and celery, add 1 teaspoon salt. Cook, stirring often, until the vegetables has softened and are starting to turn golden on the edges, about 3 to 4 minutes. Add the garlic and cook until fragrant, about 1 minute, stirring frequently. 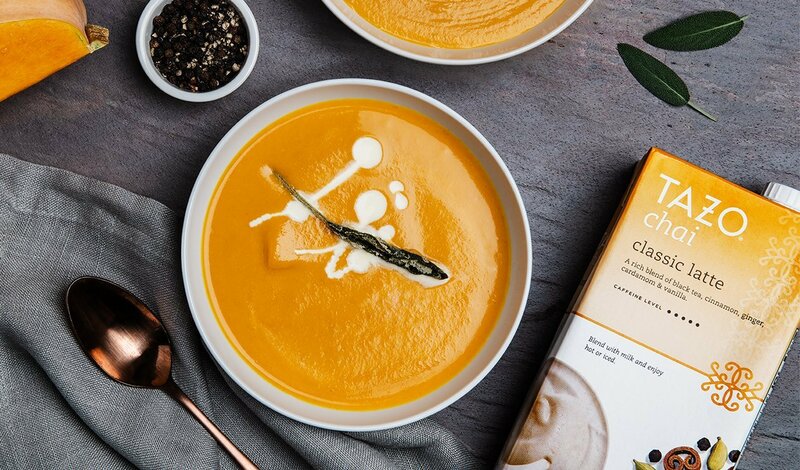 Add prepared Knorr® Liquid Concentrated Base Chicken, Tazo Tea Concentrate Classic Chai Latte, garam masala and butternut squash to pot. Bring to a simmer. Transfer the soup to blender or use immersion wand. Blend until creamy. Stir in cream taste and blend in more salt and pepper, if necessary.